One of the results – probably unintended – of Hamas' abduction of three Israeli teens is a major campaign to boost the morale of soldiers. One of the results – most likely unintended – of Hamas' abduction of three Israeli teens has been a sharp increase in communal concern among Jews around the world, expressing itself in round-the-clock prayer vigils, acts of kindness (hessed), and Torah-learning sessions. Jews of all backgrounds, religious levels, affiliations, and political leanings have joined together to appeal for the return home of Eyal Yifrah (19), Naftali Frenkel (16), and Gilad Sha'ar (16), kidnapped by Hamas terrorists last week. 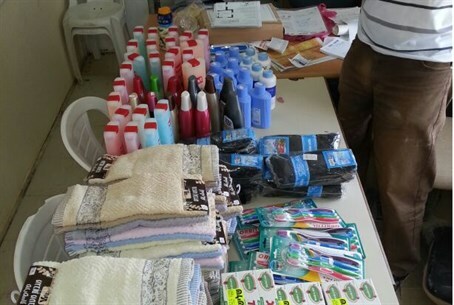 Among those acts of kindness is a major campaign organized by two teens, Ohad Landau and Yonatan Blumenthal, who have single-handedly organized a campaign to collect supplies – socks, underwear, toothpaste, etc. - for the soldiers in the field who are tirelessly combing Judea and Samaria in a search for the kidnapped teens. “We decided last week that we couldn't just sit quietly while soldiers searched for the kidnap victims,” said Landau. “We started talking to soldiers of all ranks. They told us what they had, and what they needed. We thought about how we could help out and get them the supplies they were missing. We figured that the packages we gave them would raise their morale,” he said. No sooner said than done: The boys started recruiting friends for the project, and together they called companies and retail chains, seeking donations for the soldiers. No one turned them down, said Landau. “We got pizzas from the Rami Levy supermarket chain, undershirts from Bazaar Strauss clothing stores, thousands of newspapers from Makor Rishon and Yisrael Hayom, bread and cakes, and sunflower seeds especially for Shabbat.” In addition, he said, they were able to raise large amounts of money from individuals who wanted to help out.